Savannah Shores is a quaint gated community of condos just off Hwy 17, in between Lake Arrowhead Rd and the Tanger Outlet in the center of Restaurant Row. 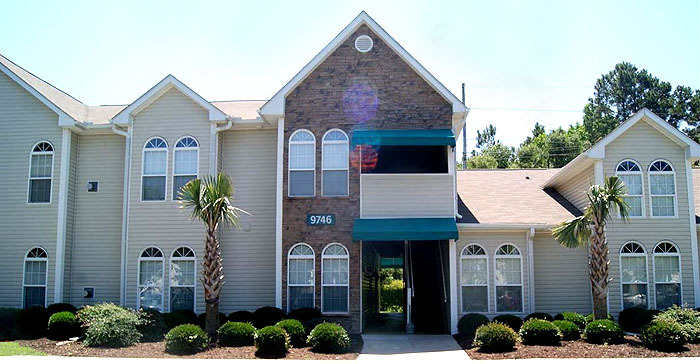 It is very close to the Arcadian Golf Course and just a short golf cart ride to the beach. It was built in 1998, but most units have been extremely well-maintained and updated. Besides being gated for privacy and security, the complex offers an unusually large and beautiful pool and clubhouse, tennis and volleyball courts, a fitness center, playground, and a putting green. The buildings are only 3 floors, and entrances are inside a hallway. The units are beautiful and larger than most, with vaulted ceilings, french doors, Florida rooms, and fireplaces. You can find 1, 2, and 3 bedroom units, and prices range from around $100,000 to about $180,000. These condos make excellent vacation rentals, as well as a perfect primary residence. Owners are allowed to have golf carts to ride to the beach, restaurants, and stores which are all around. Some of the finest dining in the Grand Strand is found within a few blocks in all directions. Of course, the golf course is also right there as well. Some units have a garage. This is also outside the city limits, so taxes are much lower! If you're looking for a maintenance-free and secure place to live and want to be close to the beach or on a golf course, this is the perfect place for you! Call us to see the available units and all these great amenities!